As promised, the second annual Recipe of the Day begins today! And it starts out with my personal favorite: sweets! 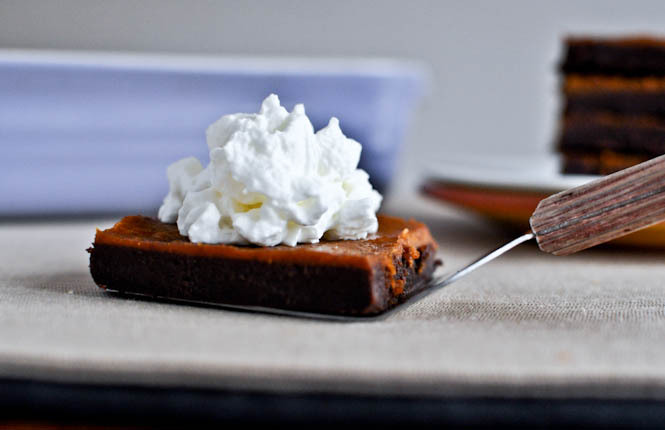 For December 1st, we’ve got Pumpkin Pie Fudge Brownie Bars from How Sweet It Is. These sound like something I would gobble down before anyone else got any. Did I mention this is why I’m not much of a baker? In a small bowl, beat eggs and vanilla and set aside. In a double boiler, add butter, cocoa, sugar and salt. Mix until the mixture becomes a batter – this will take approximately 10 minutes and at first will just look like clumps of cocoa power. Be patient! Remove the bowl from heat and whisk in the egg mixture (very slowly while whisking, so you don’t have scrambled eggs!) until combined. Stir in flour until batter is smooth, then pour in baking dish. Use a 9×13 dish for thin bars, and an 8×8 for thicker bars. For 9×13 dish, bake for 12-13 minutes. For an 8×8 dish, bake for about 18-20 minutes. Remove from oven and let cool completely! Then make pumpkin layer. In a bowl, whisk together sugars and egg until smooth. Add in pumpkin and spice, again mixing until combine. Finish by adding in heavy cream, stirring until everything is mixed, then pour on top of the cooled brownie layer and spread evenly with a spatula. Bake for 10 minutes (9×13 dish) or 15 minutes (8×8 dish), then reduce heat to 325 degrees F and bake for 18-20 minutes (9×13 dish)/22-25 minutes (8x8dish) or until pumpkin layer is set. Let cool completely (ideally overnight, or about 3-4 hours) then slice and serve. It’s starting to really bother me that I’m posting all of these amazing recipes and I’ve hardly tried any of the new ones. I’m planning to change all of that soon, so I’ll go back and update the ones I try. Today’s recipe for Peppermint Patty brownies comes to us from a blog called Coconut & Lime.